#trashbagchallenge – Yosemite – Slackline U.S. So this past weekend, per usual, we went highlining in Yosemite. 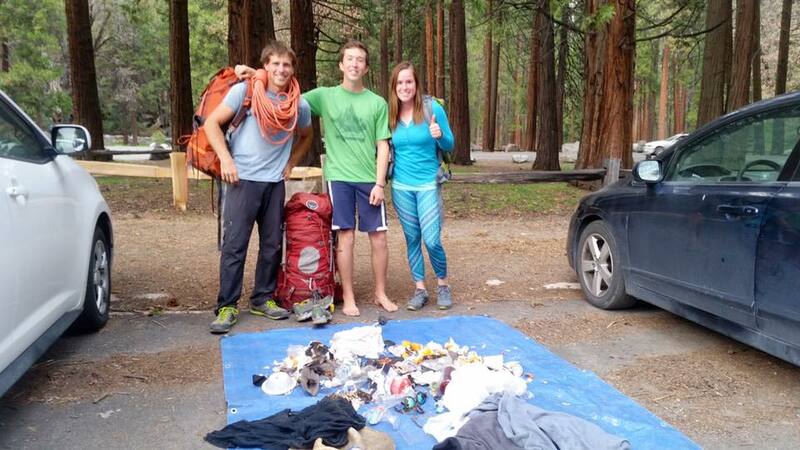 As we hiked to the top of Upper Yosemite Falls, we saw more trash than we have EVER seen on the trail. So on the way down the next day, we decided to take Andy Lewis up on his challenge and play a little game called the ‪#‎trashbagchallenge‬. Instead of running down the trail like we normally do, in a hurry to get our tired bodies home, we took our time and tried to pick up every little bit of trash we could. Ryan Jenks rappelling to collect trash on Upper Yosemite Falls Trail. At one of the vista points that looks on towards Half Dome (as seen in the picture below), we noticed there was a ton of trash below us in the bushes above the cliff. We stopped there for a minute looking at that trash, wishing there was a way we could safely pick it up without having to crawl down a steep and sketchy cliff… then we remembered…DUH. We just highlined above the falls, and we have TONS of ropes and climbing gear with us. Why don’t we just rappel down and get it? We figured no one else is ever going to hike gear up this trail just to pick up trash, so why not? While Ryan Jenks was down there, he found all sorts of goodies stuck in the manzanita bushes that tourists had dropped over the railing (five hats, a hiking pole, a few shirts, a gas canister, multiple lens caps, a couple pairs of glasses, a smashed cell phone, plastic water bottles, nalgenes, toilet paper, and lots of other trash that didn’t belong there). One thing we saw the most of, though, was orange peels. We picked up several hundred orange peels off the main trail alone. I know orange peels are biodegradable, but they still take 6 months to a year (in the best of environments) to decompose. Until that happens, they are bright orange and VERY noticeable, and when more than one person thinks it is okay to leave their peels, it adds up to a lot. Ultimately, leave no trace means just that: leave no trace. It doesn’t mean pack out everything that’s not biodegradable and leave everything that is. It doesn’t matter if it can biodegrade, it is not natural to the environment. So now it is your guys’ turn [List of names] and anyone else who wants to play… I challenge you all to go pick up some trash, post a picture, tag it with #trashbagchallenge, then tag 10 or more of your friends to do the same. Let’s start an Internet challenge that isn’t stupid for once. Ryan, Kimberly, and Garrison with trash collected during their decent. Huge thanks to Kimberly Weglin, Garrison Rowland, and Ryan Jenks for their cleanup and for giving us permission to share this post. 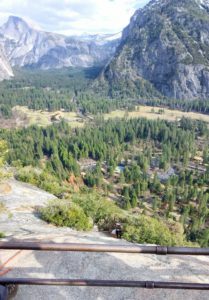 This entry was posted in Community, Conservation, News, trashbagchallenge and tagged cleanup, conservation, highline, relationships, trash, trashbagchallenge, ynp, yosemite. Bookmark the permalink.